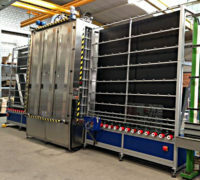 HYDRO is the highest quality series of vertical glass washing –and drying machines suitable for the flat glass industry. Sturdy and reliable machine developed to guarantee a long lasting life time. independent rinsing section and independent drying section (2 stainless steel air knives) that guarantees the highest cleaning – and drying performances. Equipped with cutting edge technology and intelligent monitoring system, controlled by the Schiavotech app from your PC, tablet or smartphone.